Discussion in 'News & Announcements' started by ChrisTurk, Feb 28, 2019. Just copying this into it's own thread since it'll be lost to the sands of time otherwise in the Daily subforum. QualifEye? What is this? Why do you love puns? 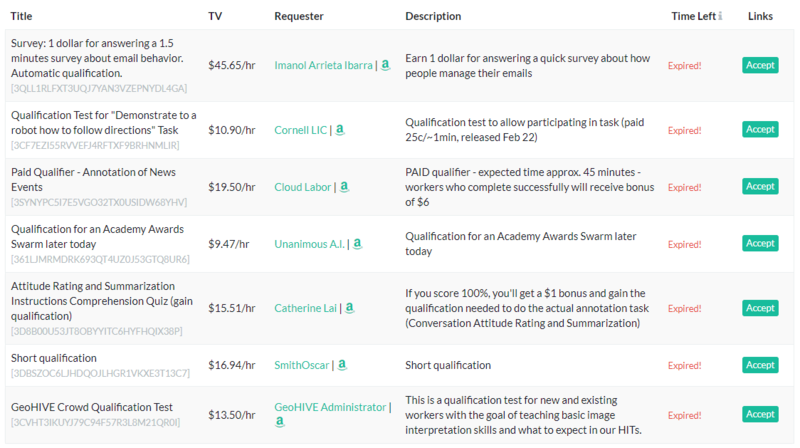 The long & short of it is that you can now use TurkerView itself to alert you to brand new qualification tests & potential qualification hits on MTurk. You don't need to be logged into MTurk, and this will not use any of your valuable page requests to do it's work. This allows you to focus on the work actually available to you, while opening up new opportunities during down time and eliminating wasted time & focus. You can actually utilize the "qualified only" options available in most scrapers to filter out the massive amount of junk that you will never be able to do. 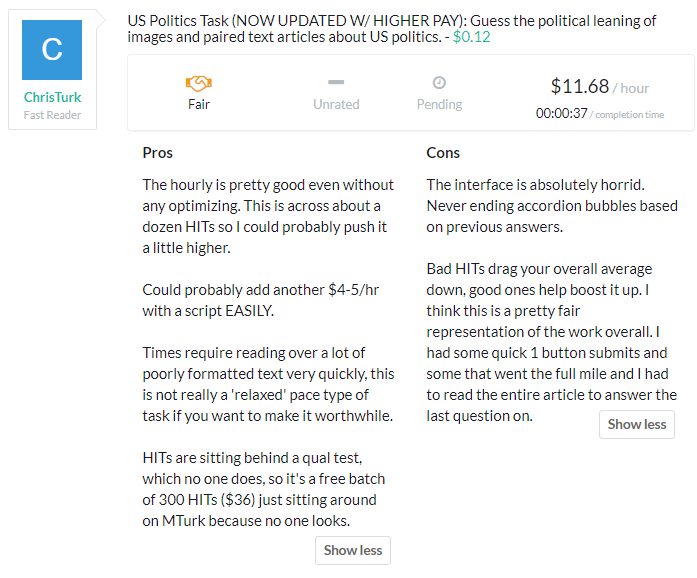 That is one of the few filters that applies directly to MTurk which actually increases the coverage of HITs your scraper will actually get to scrape & see. This will also hopefully help good requesters get their work done. In many cases requesters who go through the trouble of setting up qual tests just have their HITs languish in the void because of how difficult it is to find & complete them. So we're looking to bring good workers together with those kinds of HITs & make it easier for both parties. I think the name is funny, I'll change it some time in the future I'm sure since it's objectively pretty dumb lol. QualiFyre, maybe? ..wait I just typed that out and it sounds amazing.. "qualifier" => qualifyre.. who is coming to the festival? Sorry y'all, you know I get delirious near feature launches by now! QualifEye has a few thousand qualification tests indexed already (though for the moment it will only display the last few days worth), and it picks up new ones to the platform (or old ones making a return to being used) automatically. 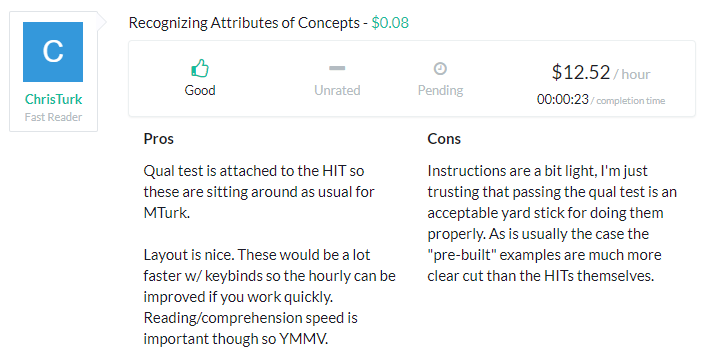 They added up to $44 worth of HITs I didn't see on scraper but did pick up the qual test & did the batches from off QualifEye and I only caught them while testing/building it, not actively using the tool. Of course YMMV, but I think QualifEye can potentially add a lot of value to your workflow & am excited to see how it's utilized! In the past few days it picked up GeoHives, Cloud Labor, & a Unanimous AI qual along with dozens of other small screening/demographic surveys. I'll be improving it based on feedback from this pilot run over the weekend, of course, but it's already pretty good at what it does. If you've got questions, comments, feedback, & the normal gauntlet of words I use here to ask for your opinions as always just throw 'em at me. I need a nap so will be back around in the morning. Aaaand as always thank you to everyone who gave suggestions & helped me test things out! I have a minor issue with QualifEye. A pair of weeks ago I had requested a feature by email: to show the requirements for each Qual Test. It was important for me because as a non-US worker I don't qualify for most HITS and I can't find it out immediately. Kindly you took care of it adding the "(i)" control, specifically intended to show such requirements. Alas, at least for me, it works just seldom. Usually clicking the (i) the next Qual Test just slides out of view like to make space for something else but no "qualifications required" appears. Sometimes, rarely, it works but just for the first Qual Test listed.